There are many types of acne, with the most common form affecting teenager years. Puberty causes hormones levels to rise, especially testosterone. These changes cause skin glands increase oil production (sebum). Oil serves as a protection to the skin as well as keeping it moist. When pores get clogged with oil, dead skin cells and other debris, acne will form. This mixture will also allow bacteria to grow, leading to swelling, redness and pus, forming a bump otherwise known as pimples. Certain medications as corticosteroids (steroids) or lithium can cause acne to develop. Other health conditions can also influence acne, particularly those influenced by imbalance of hormones as PCOS, Cushing’s syndrome and others. 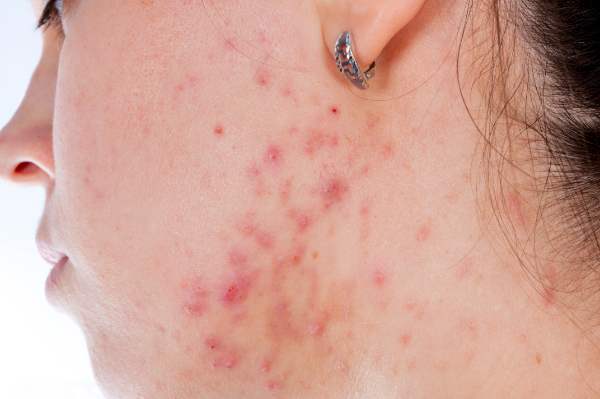 Acne is influenced by many different factors, one of which being hormones. Diet also plays a role in the development of acne. At the first appointment we will take a comprehensive intake, assessing diet, the body’s ability to detoxify, stress level, sleep patterns (when body regenerates), as well as other areas. In combination with the initial intake, we will run general labs to determine how the body is functioning on an average level. Depending on symptoms and age it may be necessary to run additional labs, one of which being a hormone panel. Upon receipt and assessment of the labs, a plan will be put in place, taking into account what the individual is able to incorporate to address the current symptoms. Examples of what can be used to treat acne includes, but is not limited to acupuncture, vitamin injections, homeopathy, herbs, energy balance, dietary changes to avoid foods that would promote further growth, natural creams, cleansing lotions, and other that will help provide the body with the tools it needs to heal itself, improve overall function and thus resolve the acne.